It’s truly summer in Minnesota now. The 4th of July holiday has past, the weather is hot and muggy, and mosquitos are the worst we’ve had in years. You literally cannot go outside without first soaking yourself in bug spray. While Hubs was home last week, we got tons of things done, but today it’s back to normal. I wanted to stay in the air conditioning though, so checked out some of my notebooks and photos to see what would work for a post. If you haven’t yet realized it, I’m a big proponent of thrift store shopping. Today I’m including some shots taken at a favorite local spot, FAMILY PATHWAYS. Family Pathways has several stores and locations. These photos are from the Princeton, Minnesota store, where they graciously allow me to stroll the aisles and snap things. Look what I found this trip. As always, just click the picture to enlarge it for a better view. Artwork is always an important part of your decor, but can be expensive, and often poorly framed. 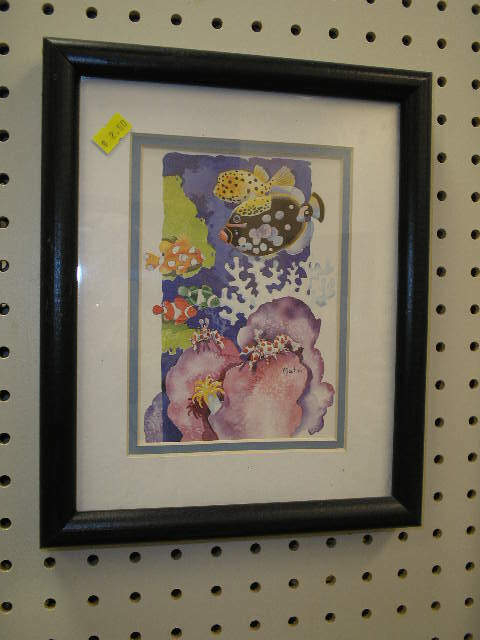 The first two items are actually original artwork, beautiful watercolors in very attractive frames. How can you not approve of these. Prices here were $2.50 for #1 and $5.00 for #2 (look close and you can make out the little price stickers). The second piece is even double matted and in a nice, layered wood frame. Wow. Picture #3 appears to be either a scratchboard or lino cut technique. Scratchboard gives you a reverse affect, white on black. The board has a black surface and you literally scratch your drawing into it, so it appears to be drawn in white. It could also be a lino cut piece, where you have a tile covered piece of wood and use tools to carve your drawing into the surface. You then roll ink on the surface of your tile and print it onto paper. 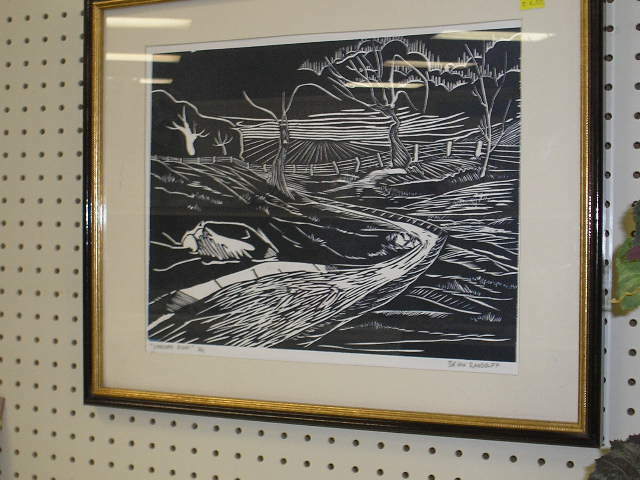 #3 is a much larger piece and was marked $7.50. The neutrality of this artwork gives you a double-duty piece, as you could use it with any color scheme. Wonderful. On this same trip, I snapped these two versatile furniture pieces. 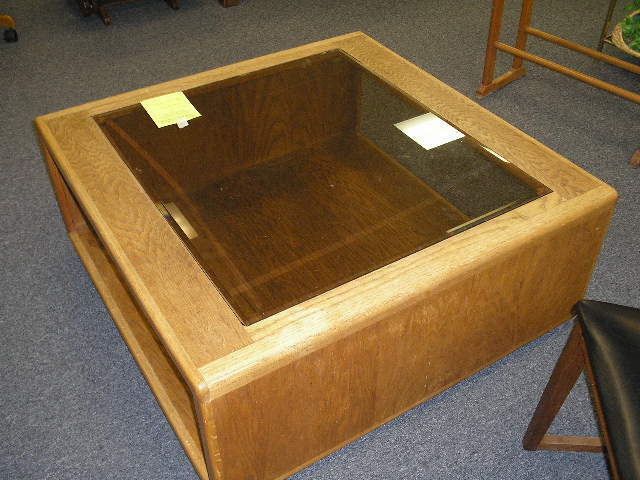 The caned back, leather seated chair was $7.00 and the fantastic galss topped, all wood coffee table was $10.00. Seriously. Just a little oil and some windex would have spruced up the table just fine, and the leather and caning were in perfect shape as is, but for those of you who like painted furniture, this would be a wonderful project for a side chair to use in any room of the house. 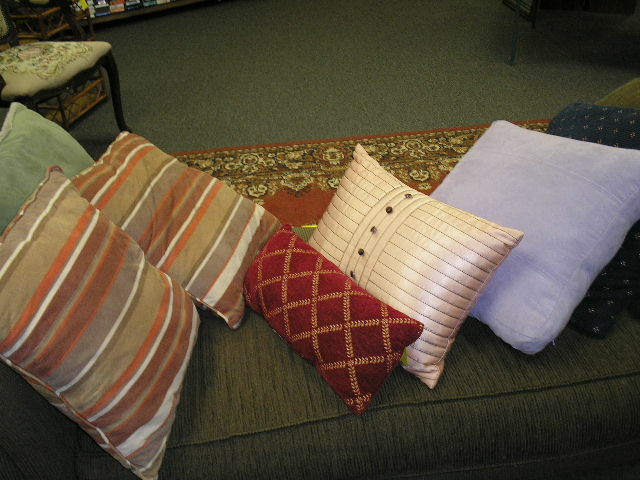 This trip also featured several nice toss pillows in varied styles, from $1-$3. I do buy used toss pillows, if the fabric is tight, in good repair and clean or washable. When laundering this type of pillow, balance your load in the washer, use cold water on the gentle or shortest cycle, and dry on the fluff cycle at the lowest temperature. Most of my 2nd hand pillows are purchased to use as a filler and I make new covers. Using “as-is” or to cover, either way you’ll want to have a clean piece. If you pay such minimal amounts, you’re not out much if they don’t make it through the wash. Regular readers know that I love pottery and have a good sized collection. This next photo is just a regular commercial piece, nothing collectible. 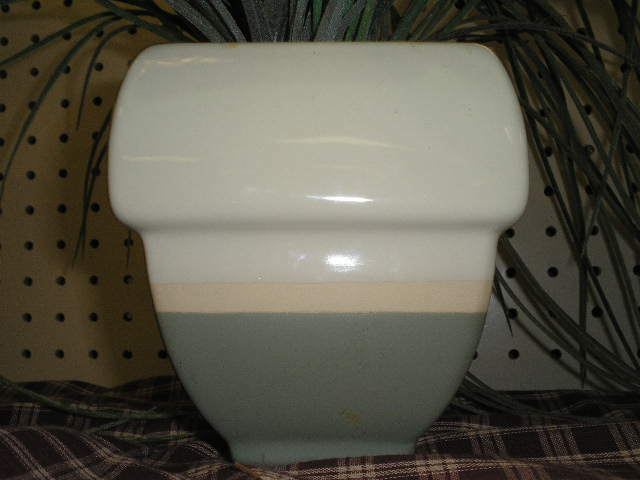 But it has a great shape and nice decorating colors, and was only at a $3 price. You have to consider everything … this had ugly, faux leaves sticking out of it, but those could easily be removed. Don’t overlook a bargain. One last example before I go. 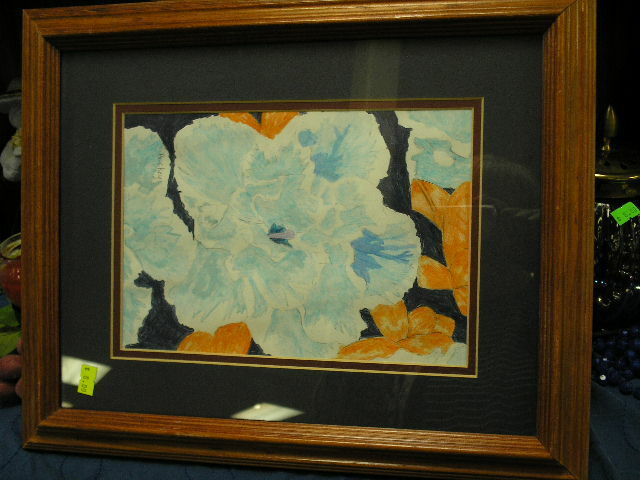 This modern, light framed piece features painted glass, with a sheet of floral prints behind. I broke down and bought this one (only $2). 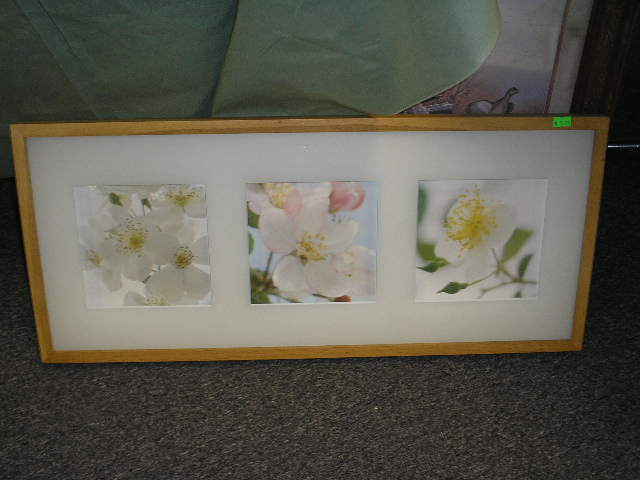 I took it home and will mount some of my own nature shots in the windows. I especially like that you can hang it vertically or horizontally. Always look for more than one use. 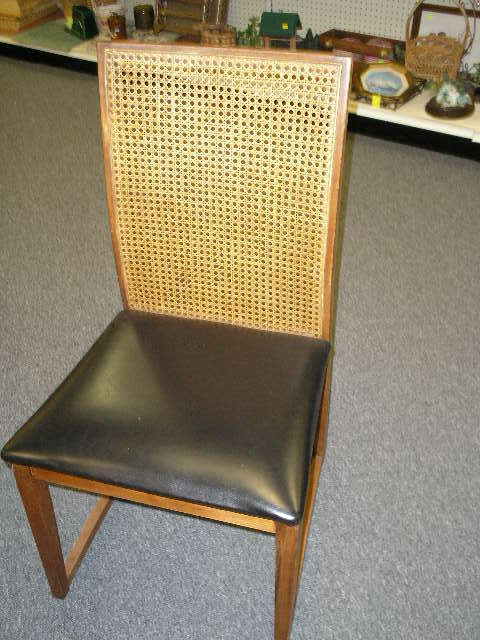 Don’t be shy about frequenting your area thrift stores. What some once considered a stigma is now something that everyone does. And I mean everyone. Just look at some of the fancy cars parked at those shops when you drive by! Everybody likes a great bargain! Being retired now, I too, have to take care with my dollars, just as I did when we were younger and just starting out. But your home should be your haven, and any type of “value” you can use to make it your special place, is a great find so have fun finding things! This has been “Thrift Store Stories” featured on Artzzle.com. You’re invited to ask a question or leave a comment. I look forward to your input. Enjoyed your thrift store trip. Price was right. Glad you liked it Joyce.